This storytime is sure to make your mouth water! This week we read stories and sang songs about cookies, muffins, and cake. Yum Yum! This is a fun, lift-the-flap book with different animals hiding in the cookie jars. Alternate clapping hands & slapping knees to this rhyme: Clap hands once, slap knees once, etc. Older children can face their parent/caregiver for a clapping game: Clap own hands, then clap partners palms, etc. Song Actions: First verse – Hold hands with a partner and walk in a circle. Second verse – Stand in a circle and clap hands. This is a stunning pop-up book that will have children and parents oooing and aaaahhing. Mother ate the pink one, then there were four. Father at the green one, then there were three. Sister at the blue one, then there were two. Two little cookies, oh, what fun! Brother ate the orange one, then there was one. I ate the red one, then there were none. 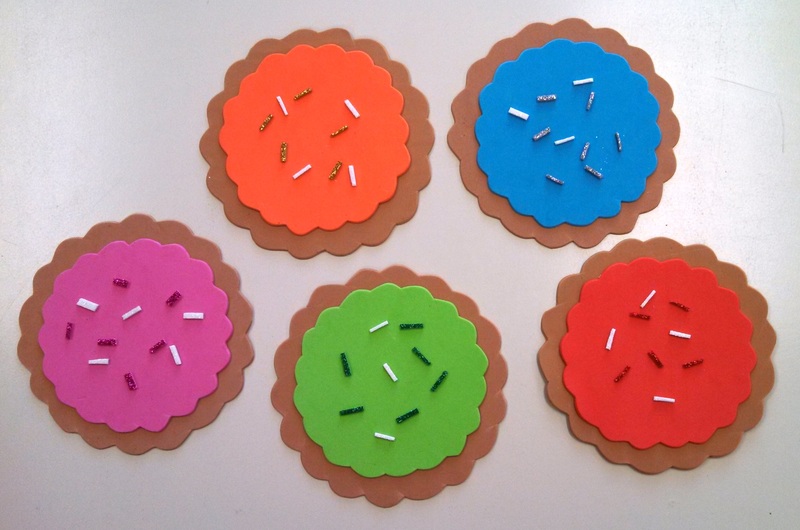 CRAFT: How could we have a storytime about goodies without eating some of our own? In addition to eating cookies, I made some playdough the night before in a variety of colors. Children played with the playdough and then took it home with them in baggies. Here are the instructions for making homemade playdough – it is very easy!